Builders need cutting edge ideas that make sense. Why should Builders consider installing YesterTec’s Kitchen Workstation Furniture (KWF) instead of cabinetry and continuous counter tops? It makes sense: Open plan, multi-task, live-in kitchens are quite different than kitchen only kitchens. So why keep creating traditional, laboratory-like kitchens for these beautiful open spaces? Instead, Kitchen Workstation Furniture (KWF) uses the same design theories that are used in all the other living spaces in the home. People understand how to create a personalized room with furniture. They’ll appreciate the opportunity to do the same in the kitchen! Placing Kitchen Workstation Furniture or even a Mini-kitchen armoire into a new home is the most affordable way to purchase our products. Including our units into the mortgage spreads the payments out just like a normal kitchen would. By combining rooms together, our workstations can actually save space because the kitchen can blend so well into any other space. Kitchens can become beautiful, multi-task rooms, eliminating the need for lesser-used rooms like living rooms and dining rooms. Saving space saves money in labor and materials, and saving materials is the best ‘green’ design technique of all. Finally, Builders can present an alternative to the stainless steel ‘trend’ by concealing less expensive appliances. Or stainless steel appliances can be concealed when they are not in use. Or commercial-look stainless steel ranges can become focal points by flanking them with beautifully balanced workstations. Many operations that Builders typically complete on site are completed in our factory. So installation is simplified. Furniture arrives in large completely finished pieces, not an assortment of boxes that need to be joined together. No cutting, sanding, fitting, hanging doors or onsite finishing is required. Stone tops arrive completely finished too! Builders, are you thinking of your time savings yet? When no wing walls, half walls or soffits are required, the room design and construction can be simplified. Move KWF pieces into the completely finished room, level, anchor, and install the utilities in them and you’re done. 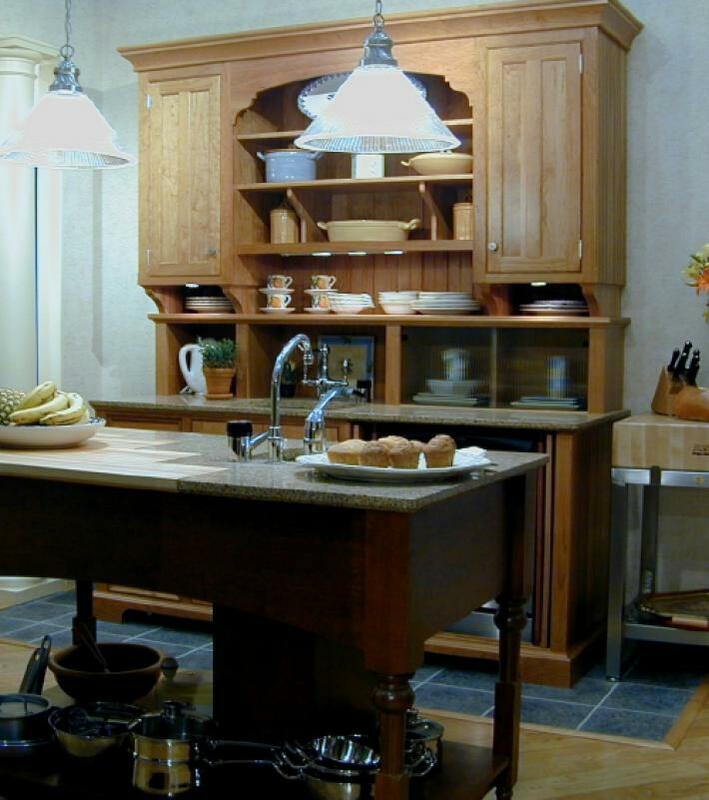 Our Mini-kitchens and Hospitality Centers are the perfect secondary kitchen or snack center for ANY home. These all-in-one units consume very little space and can be a perfect ‘upgrade’ for any room that needs a small kitchen, but doesn’t need an exposed kitchen. Change the look of your model by selling the model’s KWF! Just unhook the utilities and you’ve just made a creative sale and updated your model home as well! Owners love that each piece is an original, defined by its sequentially numbered brass plaque. National and regional editors and producers are always looking for examples of our workstations to amaze their audiences. Editorial endorsement is always valuable (and much, much cheaper) than advertising! KWF can reinforce your game plan to maintain higher standards than your competitors. This concept gets people talking, and they’ll be talking about your project, not your competitors’. KWF is unique, exciting and full of buyer appeal. The sculptural appearance of KWF is recognized as a high quality upgrade for any home. For example: One of our kitchens in a north shore Long Island Over 55 condo ‘sold’ the unit when the owners moved to Florida. Many other lesser-priced units were for sale at the same time! Take advantage of YesterTec’s legendary design services that include 3-D renderings that illustrate complete YesterTec kitchens. The many available pre-designed options can be instantly priced allowing you and/or your customers to ‘customize’ their new kitchens like never before. You’ve thought enough about your customer’s needs to offer them cutting edge ideas, wrapped up in high quality, hand-built products. After all, a satisfied customer is what it is all about! Previous ArticleBucking Kitchen Trends: Why YesterTec’s KWF is a “Fresh” Story!